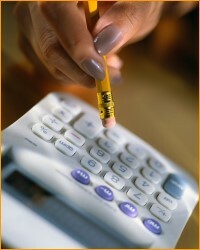 It traces its origins back to a small trading port of the Phoenicians, Greeks and Carthaginians. Some historians have indicated that the place was originally the famous Portus Hannibalis named by the famous Roman general, Hannibal Barca. During the following Moorish occupation they renamed the place “Burj Munt”. Located at the mouth of the River Arade it provides a natural harbour and has at times been known in its past as a home for smugglers and pirates. The river also provides the sea access to the up-river ancient city of Silves which was once the capital of the Algarve during the Moorish occupation. At this time the place was named Porcimunt but later in 1504 it was recognized as a town and granted the name “Vila Nova de Portimão” and became part of the possessions of the Castelo Branco family until the 17th Century. Much later it was commonly renamed as Portimão and was extensively developed in the 19th century to become one of the most important centres on the Algarve of the fishing and canning industry until the early 1980s when the recession drove the remaining factories out of business. The town with some 35,000 inhabitants is essentially commercially orientated and was the main shopping town of the whole Algarve during the 1970s and 1980s. The town's church that is the last attractive building surviving in the town dates from 1476 but it under went many alterations as from 1717 onwards. The town council appears to have adopted a policy of demolishing architecturally interesting buildings in favour of modernization. Happily, it also has a very active cultural department and there are always different forms of events happening throughout the year. The Municipal Museum is housed in an old sardine canning factory and here regular exhibitions are held that cover art, history, and general culture, all of a local and national content. 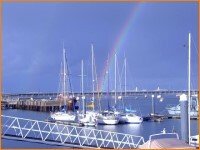 A boat Marina was recently opened adjoining Praia da Rocha and this adds the fascinating sight of the many boats at anchor and a further choice of bars and restaurants in which to pass the evening. 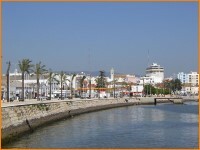 When approaching the town from the direction of Faro there is a choice of two bridges to cross. The old one runs along past the harbour but we would recommend take the new bridge. It is so well balanced in design that it can be seriously considered among the most pleasing bridges to the eye built in Portugal in the 19th Century. On the river front near the square with the cafés many different boat tours and deep sea-fishing outings can be booked. In the Portimão area is Armação de Pera with a small 18th Century fortress and a popular location for tourists with its long sandy beach. 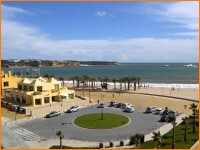 The beach village of Alvor is another popular tourist location. Still maintaining its village character with its 16th Century Parish Church its narrow streets teem with life in the tourist season. 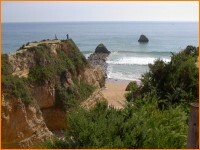 The village of Carvoeiro is a small charming beach location that is now surrounded by comfortable self-catering villas. The tourist trade happily not yet overpowers the small delightful fishing village of Ferragudo, lying just across the river from Portimão. Slightly inland is Lagoa a small administrative town. Praia de Rocha and Praia de Vau are seriously devoted to offering tourist accommodation with the added attractions of good beaches and active nightlife. The inland city of Silves and its truly interesting historical background is worth a visit. Included in the many true stories are the battles between the Moors, the Crusaders, and the Portuguese. Unfortunately, the city was for the most part destroyed by the earthquake of 1755. The Moorish occupiers considered the city at the turn of the 11th Century as the centre of all true culture in the Iberian Peninsular. Near to the town of Portimão are several sites of interest such as the Caves of Estombar, the mosaic floor of the Roman villa at Figueira, and at Alcalar the recently well restored burial tombs from the Dolman period (around 3.500 BC). Here, evidence of quite a large settlement of the 4th and 5th millennium BC which is undergoing investigation.